A portable jump starter is a great way to keep yourself from being stranded if your car breaks down. For a relatively low initial investment, you’ll save yourself stress, time, and money in the long run. A GooLoo jump starter goes a step further. Not only do they reliably and quickly start dead batteries, they all come with built-in tools. Once you buy one, it will quickly become your go-to solution for any roadside issue or emergency. Want to know more? You’ve come to the right place! Read on to find full product reviews for our five favorite GooLoo car starters. One of them is sure to be the perfect fit for your vehicle and lifestyle. 1 Why buy a GooLoo jump starter? 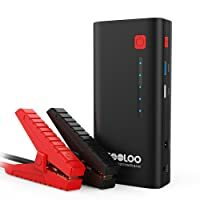 4 The Bottom Line: What’s the Best GooLoo Jump Starter? Why buy a GooLoo jump starter? 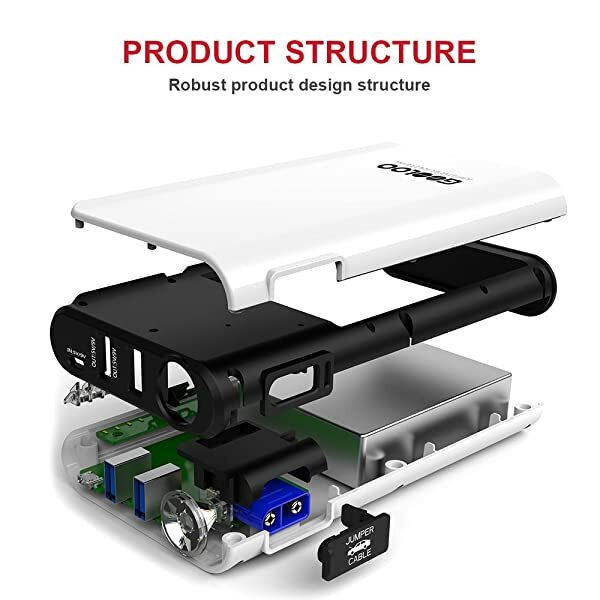 GooLoo is a Chinese brand that focuses on making portable charging equipment. And don’t let their country of origin give you the wrong impression. GooLoo devices are affordable, but they’re not cheap. While they’re a relatively new company, they’ve already attracted a lot of attention for their advanced designs. The biggest advantage of a GooLoo jump starter is that they’ll do more than just start your car. All of their models also feature high-speed USB 3.0 charging ports. They also feature a built-in flashlight, making them great all-around emergency tools. 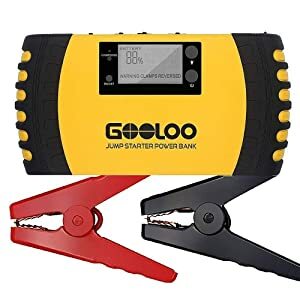 Another big selling point of GooLoo jump starters is their compact design. They use an efficient lithium-ion battery that gives you a lot of punch for the size. This makes them great portable power for backpackers and campers, too, since they won’t add much bulk to your pack. An affordable and super-compact charger, small enough to fit into a backpack or glove box. It earns high marks in regard to both convenience and value. For most vehicles, you don’t need a very high capacity jump starter pack to get the job done. Something like this GooLoo GP37 Plus will be plenty to keep you from getting stranded. Even better, it’s small enough that you can throw it in your backpack as a go anywhere phone and laptop charger. The small size of this portable car jump starter does limit the space for a display. While there are LED light indicators to show the progress of the charge, they don’t tell you much. 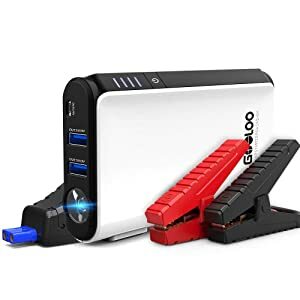 Other GooLoo jump starters will give you more information on things like amps and charge time. In our minds, though, that’s a small price to pay for such a compact, versatile device. Whether you need to jump your car or charge your laptop, you can count on the GP37. Just make sure you charge it from time to time. The battery’s too small to hold its charge more than a couple of months in storage. The GP200 combines portability and power. While it’s great for emergency starts of cars and trucks, it can also function as a portable charger for off-grid livers and outdoors adventurers. If you own a truck or SUV and need a more powerful lithium-ion jump starter, the GooLoo GP200 power pack is for you. It can jump start pretty much any non-commercial engine. Even better, it does it for less than a hundred bucks. The display screen on the GP200 is incredibly helpful. It shows you the exact amount of charge remaining, first of all, so there’s no guesswork in the timing. In addition, it displays warnings if you switch the clamps or have an otherwise faulty connection. Reliability and durability are important in emergency equipment, and that’s where the GP200 really shines. The multiple layers of safeguards prevent damage to your engine. The power pack itself is built to last, too. And it’s not just for emergency situations, either. 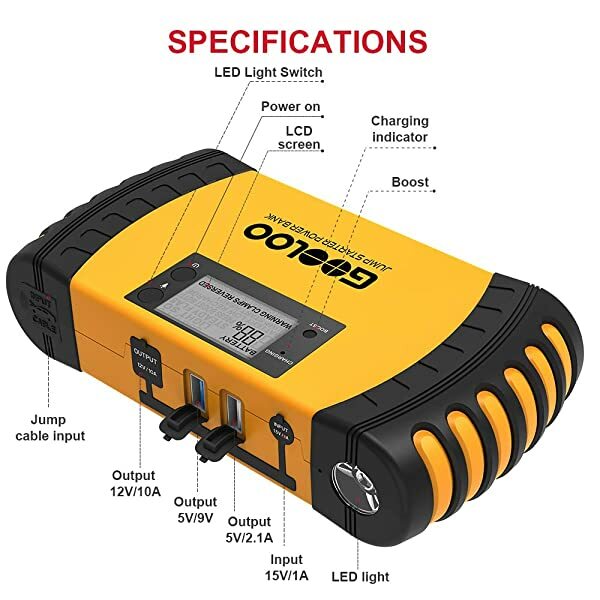 This is also a great portable jump starter for campers and other outdoors adventurers. This is the best car jump starter to keep with you for emergencies. With more power than most portable chargers, it quickly and reliably jumps cars, trucks, or SUVs, even in wintery weather. You can think of the G1500 as the big brother of the GP37 reviewed above. It uses a similar slim design that, though a bit bigger, is still a very portable charger. The biggest difference is that the G1500 gives you more power (and costs a little bit more). More power translates to better cold weather performance. The 1,500 peak amps it can put out will bring a completely dead battery back to life. While there’s no LCD display, LED indicators show the total charge remaining, so you’ll know when it needs more juice. 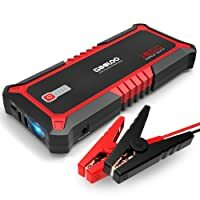 A larger battery also means this GooLoo jump starter lasts longer in storage. While it’s recommended to top it off once a month, it can hold a charge for up to six months. That low maintenance requirement is why it gets such high marks for convenience. This is the best GooLoo jump starter for the budget-minded consumer. Just keep in mind the lower peak amp rating does limit its use to cars and light pick-ups. If price is a significant factor, you’ll want to take a look at the GooLoo GP80. It’s the best jump starter for buyers on a budget. You’ll get the same 8-layer protection in the clamps that come with all GooLoo models but at a lower cost. Having said that, this GooLoo jump starter won’t work for everyone. Its peak amp rating is on the low side at 500 amps. That’s enough to start a car most of the time, but it can’t provide enough power for 8-liter engines. The GooLoo GP80 is also a bit bulkier than other models in their GP line. Of course, it still takes up way less space than a set of jumper cables. This isn’t the most powerful jump starter out there, but it’s all most people need and at a great value. 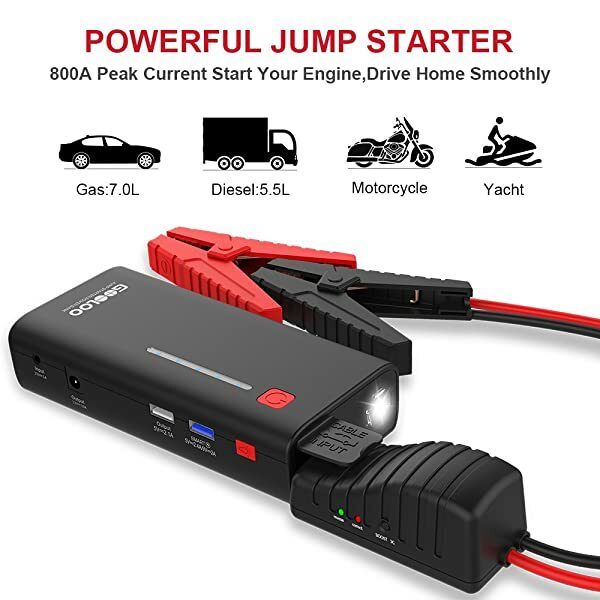 This is the same jump starter as the G1500 but with a better Type-C port. 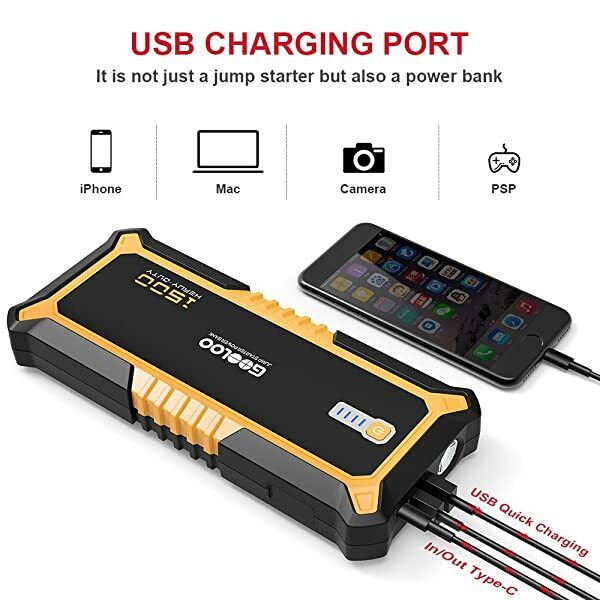 It can charge more devices than any other GooLoo jump starter. For pure engine starting, though, the G1500 gives the same performance for less money. Here’s another option for people with bigger vehicles. The G1500-Plus is very similar to the G1500. It has the same slim build and 1,500 peak amp rating, so it’s just as portable and powerful. They’re so alike, at first glance it might seem the only difference is the color. The main advantage of the G1500-Plus is the improved Type-C charging port. This lets it charge a wider range of devices, including Chromebooks, MacBooks, and handheld gaming systems. This might not be related to jumping cars but it’s still useful. Giving your kid the option of charging their Switch on a long road trip can be a lifesaver, for example. You’ll also pay more for the G1500-Plus. It’s a small enough price hike it’s worth it if you use a device that needs it. If you don’t care about the Type-C port, though, you’re better off with the standard G1500. The Bottom Line: What’s the Best GooLoo Jump Starter? As you can see, there are some things you’ll get from any GooLoo model. The main difference between models at different price points is the capacity and peak amp rating of the battery. In terms of performance, the GooLoo G1500 is our top pick for the best lithium jump starter. It can start any size engine and revive even completely dead batteries, in all weather conditions. If you have a smaller car, though, you can save yourself a bit of dough by buying the GP200 or even GP37. Whichever one you go with, a GooLoo jump starter will make sure your next road trip is worry-free.